The Hittites are Indo-European people, which in II Millennium BC penetrated into Asia Minor and started to reign over indigenous Proto–Indo-European. The Hittites founded, in the eastern Asia Minor, very powerful Empire between 2000 – 1200 BC. Hattusa was a capital city (today’s Bogazkoy, north Turkey) located along the river Halys (also Kızılırmak). The earliest evidence of the Hittites presence in this area is recorded on the Cappadocian tablets and it dates back to the 19 century BC. Cappadocian tablets are written records of Assyrian trade colonies whose center was in the city of Kanesh (today’s Kültepe, Turkey). The city Kanesh corresponds to the Hittite city Nash, according to which the Hittites gain its name in their own language, and that name was Hatti. In these records are names of powerful people with whom Assyrians traded, and many of these names were Hittite names, although we do not have any testimony about migrations of Hittite and other Anatolian peoples. Another text, which tells a story about presence of Hittite, is an inscription of the ruler Anitta in 1750 BC. This inscription helped us to learn the fact that Anitta was a member of the Hittite dynasty and king of the city Nash. The inscriptions first time mentions the capital Hattusa, which was destroyed, cursed and razed. If the ancient homeland of the Hittites (Indo-Europeans) was in East Asia, the nearest road of migrations was through the Bosporus, but since the homeland was in the area of the Russian steppes, the Hittites could only cross the Caucasus and settle in Anatolia. Any route they took, it is assumed that the Hittites many years roamed around the area before they final settled. Therefore, some scientists have concluded that they did not arrive quickly as conquering nomads, but that their settlement is a result of long-term and gradual infiltration of the agricultural population in search of fertile soil. Hittite map around 1600 BC. 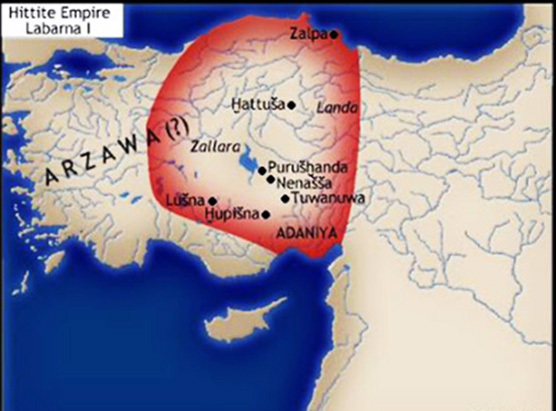 The founder of the first Hittites dynasty was king Labarna. 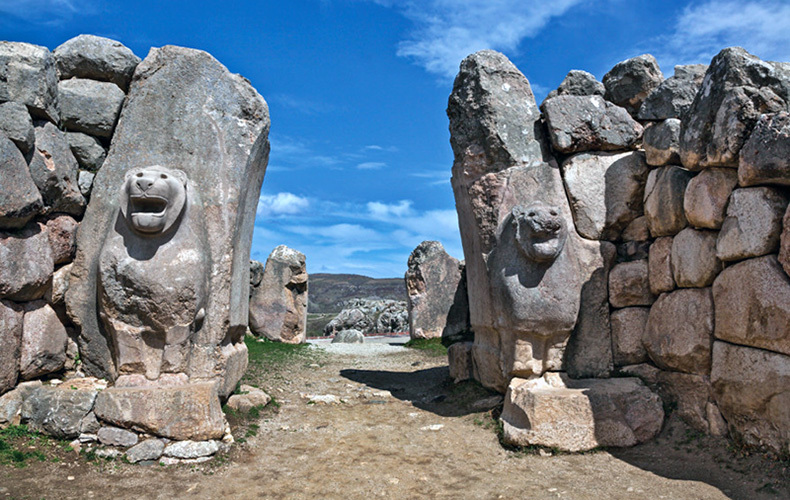 Hittites dynasty was founded around 1650 BC, whose name in the Hittite language means ruler. The center of his reign was the city of Hattusa (Khatti) in today’s city Bogazkoy in Turkey, and he gave himself a name Hattushilish as the capital name of the state was. He rebuilt the city, which was devastated by Anitta. His political success was so great that his name was later given as title of Hittite rulers. Hattushilish sought to occupy and control the important trade routes between Anatolia and Mesopotamia, the Aegean islands and European continent, in the hope that in that way it will control production of tin. In its expansion to the southeast, Hattushilish had a number of military successes and he encountered with the Mesopotamia culture. He knew how to reward military successes. He did that by thoroughly elaborated military tactics, chariots, and knowledge of metals. Hatushilish was succeeded by Hatushilish I. He continued his father’s expansion policy by fighting in northern Syria, but he has experienced a number of military defeats: he lost the battle for the city of Aleppo (which was an important city on the way between Assyria and Mesopotamia), and he was defeated in the battle against the city of Zalp. Hatushilish I, was succeeded by his grandson Mursili I. His grandfather carefully planned his education, and he ordered that they do not give a boy anything but bread and water until he is able to take over the kingdom. About the reign of this ruler, we found out from the works of the rulers, which later came on the throne, and from the source of neighboring tribes. Unlike his grandfather, his military actions were successful. He won the city of Aleppo, and he used weakened power of the Assyrians and the state of Mitanni. He attacked Babylon and he conquered it in 1595 BC. This attack made Mursili I memorable as the greatest king of the Old Hittites Kingdom in the sources and tradition of Hittites. Mursili I very carefully planned its own tactics and he attacked Babylon, when it was the weakest i.e., during period when Hammurabi dynasty was falling apart. Mursili, as a sign of victory over Babylon, stole from Babylonians a statue of the god Marduk. He was patron deity of Babylon. The statue has never reached Hattusa, because on the way to Hattusa unknown tribes stole it. The king still came back to the country very rich and he was celebrated as a big conqueror winner. However, when he returned home, a situation was completely opposite from the one he just experienced. The situation in his house was not ideal, because his wife Harapshil cheated on him with some nobleman and along with him hatched a plot in which the king has lost his head and the throne. After his death, in the Hittite Empire came a period of great internal riots and anarchy, because many wanted to get the throne. During this period, various kings came on the Hittite throne of which are known to us: Hantili, Zidanta, Ammuna, and Huzziya. The last king of the Old Empire was Telipin. About its reign and life we have learn from his will, which by its content is a unique text in the literary history of the ancient Near East. His will was written in Akkadian language, and later it was translated into Hittite language. In fact, his will became the Constitution, which Telipin left to his successors. This will (the constitution) can be characterized as the first attempt that relations inside of the country administration are regulated and organized in legal manner. Therefore, Telipin’s will is also called “the first constitution in the world’s history.” The will begins with a brief overview of the Hittites history, from which we learn the names of Hittite ruler from the pioneers of the first dynasty to Telipin and Pankuu’s addressing – to the Parlament of Nobles.